Back when all my friends were going bonkers over “Star Wars” in the late 1970’s, I was obsessed with “Close Encounters of the Third Kind“. I even wanted to become a “ufologist” like Dr. J. Allen Hynek. I bought/read dozens of books and was absolutely convinced UFO’s and alien hijackings were real. Anyone who has been following this blog for a while knows two things about me: 1) I DESPISE “conspiracy theories” (note my thorough debunking of “The Four Basic 9/11 Conspiracy Myths” written nearly ten years ago), and 2) I don’t suffer fools well. If you are going to attack me and demand (additional) “Proof!” that something I tell you is true, you had better be on firmer ground than I with “proof!” of your own at the ready. And if your idea of “legitimate trustworthy journalism” is a pro-Russian blogger in Minsk, while calling The New York Times and Washington Post “fake news”, your opinion carries all the weight of a mouse fart as far as I’m concerned. The VERY ELECTION of Donald Trump seems to have birthed an entire legion of tinfoil hat wearing “Conspiracy Theory” paranoids. Hey, I get it. I supported Bernie, and the fact Cheetolini occupies the White House today still defies belief. But there was no “conspiracy” against Sanders and the Media didn’t decide the Primaries OR the General Election winners. The Super Delegates & Electoral College did. If you read some of the vitriol I see on my Facebook page… STILL… six months after the election… towards Hillary Clinton, it’s difficult to understand how so many of these same Troglodytes foaming at the mouth over their hatred for Hillary could believe Trump needed “The Media’s” assistance to win, or how they made Hillary popular enough to defeat Bernie. Like others have said: if you could reason with zealots, there wouldn’t BE any zealots. And now, with this counter-attack on a Syrian airfield in response to their use of chemical weapons… and let’s not gloss over that detail as we grow numb to the words. “Chem-i-cal Wea-pons“. Death by chemical weapons is beyond horrific… burning eyes & skin, choking to death as your lungs are scorched by acid, people/CHILDREN writhing in agony, vomiting blood till death is a welcome relief… the tinfoil hat wearing crowd… with all the expertise as a 9/11 armchair physicist… appear to be more than eager to defend Syrian President Assad… a brutal dictator (like his father before him) who has been bombing entire cities full of people who’ve dared oppose him for the last seven years… on the grounds that suddenly… after seven years of slaughtering 400,000 “of his own people”… are asking, “Why would he use chemical weapons on his own people? Especially when he was so close to winning?” Instead they seem incredibly quick & willing to believe that in fact their OWN country… the United States (admittedly no angels ourselves)… is actually framing poor innocent Assad. (Note, in the April 4th attack, not only did Syrian fighter jets drop chemical weapons, they also bombed grain silos with the goal of starving the rebels… whom we know aren’t simply “ISIS fighters”, but entire cities that include women & children. Seriously? Okay, let’s pause for a moment and use some common sense here. …because those are your options. Some disbelievers claim this was a distraction from the salacious approval of Judge Gorsuch to the Supreme Court via the “nuclear option”. Hardly. Republicans acting like Republicans isn’t a catastrophe worthy of committing secret war crimes by dropping chemical weapons on children that would result in the Trump Administration being tried in The Hague for War Crimes should the truth ever come out. The “risk/benefit” ratio is wildly off there. They are wildly untrusting of Western Media, yet readily accepting of what documented vicious tyrants like Assad & Putin tell them. I just don’t get that. Once you reach THAT level of mistrust of your own government, it’s time for you to go… another country or a padded cell. It’s your choice. Following the Iranian hostage crisis in 1979-80, our greatest enemy was Iran. And when the Reagan Administration took over in 1981, they decided “the enemy of my enemy is my friend”, so they befriended Saddam Hussein (who had been at war with Iran for years.) And they gave (conventional) arms (and money) to Saddam (and… as we discovered later… to Iran too as part of the “Arms for Hostages” deal they secretly brokered). As the Iran/Iraq War escalated, Saddam used chemical weapons on Iran and we did nothing about it. Then, at the very end of the Reagan Administration, Saddam used chemical weapons yet again… this time on his own people. Iraq has always been a nation of three violently opposite religious sects: The Shia, The Sunni’s and The Kurds. The Kurds despised Saddam and wanted him gone. And apparently the feeling was mutual as Saddam actually dispatched agents to assassinate Kurds that dare leave Iraq to live in London or Germany. Sounds completely counter-intuitive, right? Why would Saddam want to murder the people he hated for moving away? Because that’s just the kind of guy he was. He couldn’t make their lives miserable living abroad. He wanted them in Iraq where he could make them suffer. In March of 1988, Saddam attacked the Kurdish occupied town of Halabja with chemical weapons. Again, we turned a blind eye (until Bush Jr used it as an excuse to invade Iraq in 2003.) “Why would he attack his own people” some of you might ask? (As you are asking of Assad today.) Because, as I already pointed out, they hated Saddam, launching attacks trying to assassinate him (and years later, a Kurdish ex-pat named Ahmed Chalibi would convince a gullible George W. Bush to take Saddam out for him by claiming the existence of “stockpiles of WMD’s” that no one had seen or could prove the existence of), and the feeling was mutual. But the war in Kuwait dragged on… and on… and on… into 1991. The Kuwati’s had hardly no military to speak of (nothing to compare to Saddam’s “fourth largest army on the face of the earth” after the U.S., China, and Russia) offered little in the way of resistance. Then, news of “atrocities” (same real, some fake) begin to reach the U.S. Media, literally embarrassing the Bush Administration into responding. And by late February 1991, Saddam had been kicked out of Kuwait and was now our sworn enemy. Are you noticing the parallels yet? In December, then President-elect Trump appeared to side with Russia over the Syrian conflict and stated his opposition for any further support of the rebels, leading to the fall of Aleppo before he even took office. The result was the ratcheting up of an already ongoing war, yet four months later, rebel forces continued to hang on and Assad’s frustration continued to grow. 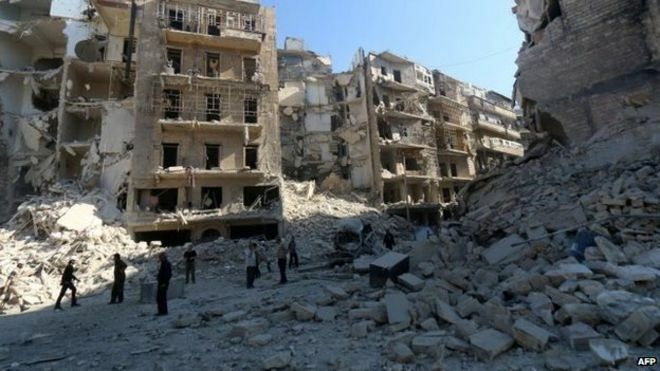 The second largest city in rebellion against Assad, Idlib, became the new rebel stronghold. And just as Saddam was told we wouldn’t interfere in 1990, Trump & Tillerson told Assad on April 4th that “regime change in Syria” was going to be left “up to the Syrian people” and that we would just have to live with Assad’s presidency as a fact of life. Given the green light of a new American president… friendly with their ally Russia… promising a non-interventionist policy regarding Syria, a frustrated Assad… who had a history of using chemical weapons (map)… even against his own people… leapt at the chance to crush the rebellion once and for all. And this is where the doubters ask for “proof!” despite the fact there is nothing unusual or out-of-character for him here. “Assad would be “crazy” they proclaim to do this now “when he’s so close to victory”. That’s quite an assumption there. “So close to victory?” Says who? The fighting has been going on for seven years, and Aleppo fell four months ago, yet Assad’s opponents continue to fight. 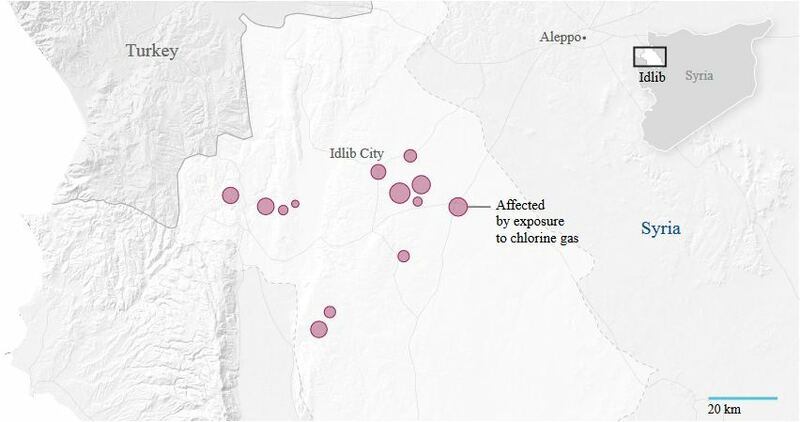 It is impossible to verify whether of not every location where chemical weapon exposure occurred had a hidden cache of chemical weapons within it, but (Two) try to imagine the extraordinary stroke of good (bad?) luck required of all those Syrian fighter pilots to have stuck SO many hidden caches of deadly (and apparently wildly unstable) chemical weapons spread across Idlib province. They freely admit they had no idea they were there, and yet somehow they just happened to locate a dozen such caches precisely where they bombed? 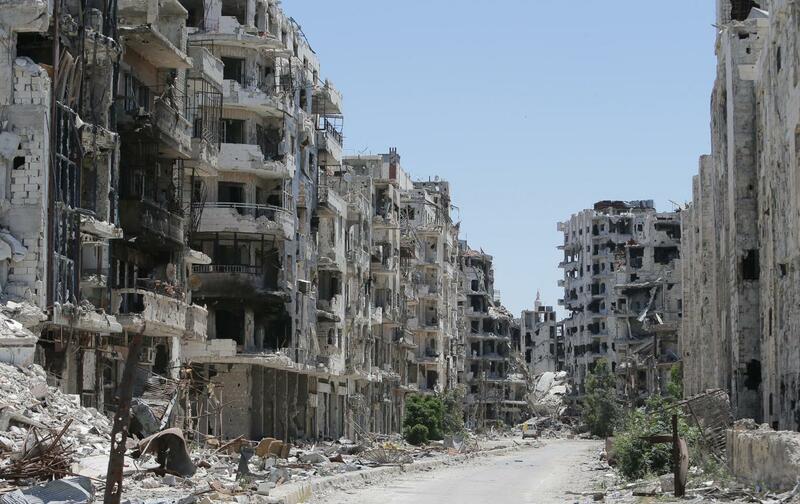 Assad needs to stock up on lottery tickets before his luck runs out. Three, “Transporting” such dangerous chemical weapons for miles across Idlib Province would be incredibly dangerous with a high risk of accidental exposure that could kill thousands should an accident occur. So if the rebels produced those weapons, they didn’t move them around. They would have had to of been made locally… or more precisely at the very site that was bombed. Why? What use are they to them there? Four, the ability to make such weapons is not a common skill, and not something you learn quickly. This would mean a merry band of wandering minstrels chemical bomb makers traveling from town to town to make a cache of chemical weapons for storage “right there” and then moving on. That seems unlikely… not impossible, but highly improbable. Number of suicide bombings in Syria over the past seven years that involved chemical weapons? ZERO. Defenders of Assad keep asking “Why now when he was so close to victory?” So then, couldn’t we ask: If the rebels were “so close to defeat”, why would they sit on these huge stockpiles of chemical weapons and not use them? That makes even less sense. Another popular question: “I thought Assad gave up all his chemical weapons in 2014?” That’s a fair question. Problem is, we just don’t know. According to their ally Russia, Syria turned over 1,300 tons of chemical weapons to them claiming it was their entire stockpile. It was also the job of Russia to close down all of Syria’s chemical weapons production facilities. Russia admits they were only able to shutdown 21 of 23 facilities because two of them were in warzones they could not safely enter. As I’ve pointed out in other op/eds recently, the seething out & out boiling vitriol I read from Hillary haters on a daily basis now almost defies comprehension. I mean, I’m no fan of the woman and didn’t vote for her last November, but you’d think Hillary personally dropped by their house and boiled their bunny just to hurt them personally. I seriously think there are a few million alarmingly immature people out there in desperate need of psychotherapy… emphasis on the word “psycho”… driven to irrationality by the 2016 election. It is now “a given” and forlorn “fact” to them that “Hillary Clinton gave those chemical weapons to the rebels” when she was secretary of state. So you ask simple questions like “How?”, “Where did she get them (since we don’t make them)?” and “How did she transport them to the rebels in Syria?” Often what I get in return are unrelated links to claims of what an evil person she secretly is, links to unrelated & debunked clams she sold 20% of our uranium stockpiles to Russia (not true, and has nothing to do with WMD’s or Syria), and inevitably childish name calling. They like to compare the “false claims Saddam had WMD’s” to these claims against Assad, but when I point to the fact that both Saddam and Assad used chemical weapons against “their own people” numerous times before, they don’t see a connection. And while Saddam was only “accused” of having WMD’s, we have evidence here in this very attack in Syria that they actually exist (Russia and Assad admit it, claiming they belonged to the rebels but do not deny their existence)… only their “ownership” is in dispute. During “Meet the Press” yesterday, Trump’s UN Ambassador Nikki Haley pointed out that Russia’s first reaction upon hearing the news of chemical weapons turning up in the attack was to defend Assad, not express horror or concern over victims of a chemical weapons attack. That seems quite disquieting in its own right. You hear civilians… including women and children… were exposed to chemical weapons, and your first reaction isn’t shock or questioning, but to defend someone THEY KNOW (remember, they admit to the bombing AND have troops stationed at that airfield) just dropped the bombs resulting in that chemical exposure? Lesson One in trying to convince people you’re not a cold-blooded killer: show a moment of sympathy for the exposed children and make a few calls before you rush to defend the bombers. And on a personal note, people bashing “The Media” as “an enemy of the American people” is an anathema to the 1st Amendment and a greater threat to Democracy than anything these Conspiracy Theorists seem to think is actually going on. People tend to not to ask questions about what they see/hear/read when that something tells them what they already want to believe to be true, is. Fox “news” has built an entire media empire on that very concept… and now I see people claiming to be “Progressives” doing it too. Fox viewers are repeatedly rated as the least well informed consumers of news in the country. Some polls have even shown that people who consume NO news at all are often better informed than Fox viewers because they come to a conclusion first, then look for a source to “confirm” it. And anyone who tells them differently is either “a liar”, “badly misinformed” because they don’t get their news from the “right” sources (like they do), or just don’t know what they’re talking about. “Facts be damned” and there’s no point in trying to present them with evidence to refute those beliefs. Postscript: The past weeks insanity led me to do something I’ve never done before and delete nearly four dozen of my so-called “Facebook friends” who devolved into insult spewing, Conspiracy babbling, children. I just couldn’t take it any more. The head-pounding STUPIDITY was making my teeth hurt. But in return, I picked up about three dozen new “Facebook friends” and a couple hundred likes from people who agreed with me over the recent heightened level of insanity and coarseness of discourse. So to all my new friends, thank you and welcome. Next weekend, M.R.S. will be on Easter hiatus, but I promise to return two weeks from now with more insights and history. See you then!